Before we start, it would be helpful if you could explain what good energy means? For me, good energy is really about having a practical interaction with climate change. In the business sense, we give people the opportunity to choose a 100% renewable electricity supply. The mission statement on your website says that you want to turn the energy market upside down, and help the UK achieve a future that’s powered purely by renewable energy. That sounds like a tall order – do you think it is achievable? Yes, if we decide that is what we want to do it is completely achievable. It is not outside the realms of possibility. If I said I want to make the UK 10% renewable, that wouldn’t really create a seismic shift in thinking about how to achieve it. So unless you consider the extreme position you won’t understand what systematic change needs to happen. So what personally made you so passionate about this? I started off as a scientist, and for part of my science degree in physics I studied meteorology. It was that background on climate change and understanding what a big issue it was that got me involved. I then went to work in Brussels on energy policy, and when I came back to the UK I felt that governments and scientists were leaving individuals out of the conversation and they were leaving them out of the equation as well. Everyone rushes off and tries to negotiate large treaties with the UN, and bypasses the people that really count. They don’t understand that you need to take them along with you. Your next choice looks at the world of business. 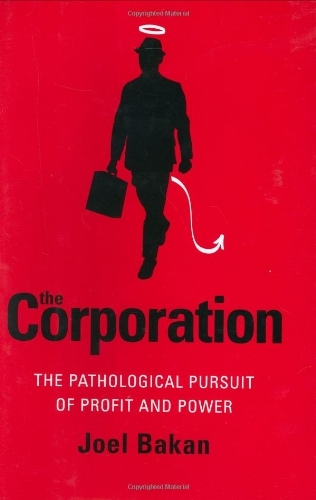 Joel Bakan’s The Corporation explores how one of the most powerful business institutions has managed to successfully hijack governments and let greed take control. I read this book on holiday and found it interesting, because I hadn’t really thought about the history of the corporation. It goes right back to the South Sea Bubble, where early investors were very unprotected. Then there was a lot of legislation put in place to protect shareholders and to make sure their interests were always looked after. As a result you ended up with corporations where the corporate structure is really only there to protect the shareholder and doesn’t take anything else into account. What struck me is the comparison with how society is governed. For example, if you live in a Christian society the Ten Commandments are mirrored in legislation – Thou Shall Not Kill, Thou Shall Not Steal – but those kinds of societal norms are not reflected through the corporate structure. Presumably powerful, self-interested corporations make life difficult in your quest for good energy. It is interesting because, as a relatively strong chief executive, when I present my ideas to shareholders I always talk about the mission of the company and what we are here to do, but that isn’t enshrined in the legislation of my company. It is not naturally enshrined in any business that they are there to have a purpose, and I think it is a really interesting concept for us whether businesses should be responsible – for example in their impact on the environment. At the moment that is something government legislates about. It does, but it is not part of your responsibility as a company. We have corporate social responsibility as a concept, but one that is too woolly. What I found fascinating about the book is that there are people who go to work every day and do things in their jobs – because of shareholder returns and because they are doing it for the company – that they would never consider doing in their private lives. Do you think, after all the global economic problems, corporations are getting weaker and a new, perhaps more ethical value-system is taking over? I think there is space for a new, moral value-system to be put in place for corporations. And the general populace, who are having to bail out banking systems, definitely feel that representation of the people or some representation of the environment should be a key part of that. The best thing about David’s book is that it simplifies all the issues. So many people in the energy market make it really complicated, so that no one can really understand it. 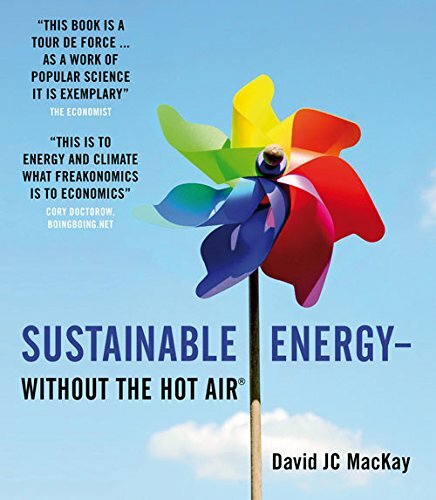 What David did was to take it down to some simple numbers across the board in terms of how much energy people use in their homes, how much energy people use in their cars, what we use as a society, and what that is going to look like in the next five, 10 or 20 years. If we want to provide power from alternative sources, where can that come from? What are the resources at the moment in the UK and what are the possibilities? 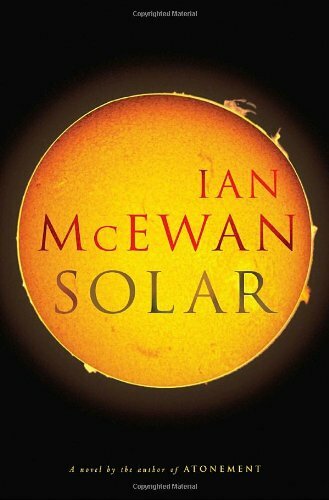 This is a fantastic piece of work to start people thinking about this in a wider debate, rather than just amongst scientists and energy specialists. He broadened it out to lots of people who might find this kind of information difficult to collate themselves. What kind of policies did he come up with? He came up with six or seven possible outcomes of what you could do. He now works at the Department of Energy and Climate Change, and they have created a pathway so you can create your own model of the future based on the work that he did in the book. We’ve done that at Good Energy, looking at what you would need to do and what technologies you would need to introduce to make the UK 100% [renewable] by 2050. And what kinds of things would you need to do? It involves changes to UK energy at every stage of the process, from grid management to investment, and from research and development to transport. The answer will be increased electrification of all our networks, in turn pushing electricity demand to at least double current levels. Meeting that increased demand from renewable sources will be more than a goal, it’ll be a necessity. 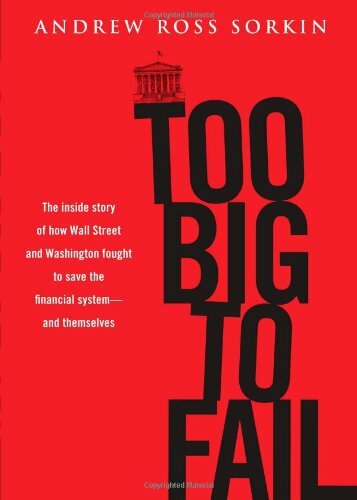 Your next book, Too Big to Fail by Andrew Ross Sorkin, has got you thinking about how the bankers could fit in with all this. I wanted to read this book because I didn’t really understand how the global economy managed to get into the current mess. Suddenly the banking system was collapsing and everyone was talking about sub-prime mortgages. And it was fascinating to read this story of greed, egos and disregard for process. There were all these stops and checks to stop things like this happening but the key players had dismissed them all, which was amazing. It was so arrogant. So where do Wall Street bankers fit in with clean energy and climate change? One of the things that is really important to any business is that you need to get money from somewhere to do it. The insight I got was that the money markets seem to be happy to implement some very high-risk strategies if they think they can make huge amounts of money – and they did on paper for many years. And actually we need huge amounts of money to be able to deliver the renewable targets that we are talking about. So it got me thinking, what are the issues within banking, who do they talk about, what do they think and might they be interested in us as a market? Were you trying to get into their minds to persuade them to invest in you? It was partly that, but it is also about how we frame renewable energy in a way that can be an alternative to the sub-prime market. I am not suggesting that anybody would want to repeat the risks that were taken there, but obviously people were happy to take a certain amount of risk. What we need to do is to persuade bankers that renewables isn’t a high-risk strategy, and it was interesting reading the book to see what the methods for doing that were. Do you think renewables could be lucrative for bankers as a market? Definitely. Renewable energy is fascinating because it is a very long-term asset. At the moment pension funds can either buy property, which isn’t doing very well right now, or invest in equities, which isn’t a very good bet either. So I think that maybe they should be investing in renewable energy projects, which will happen in the future out of necessity. 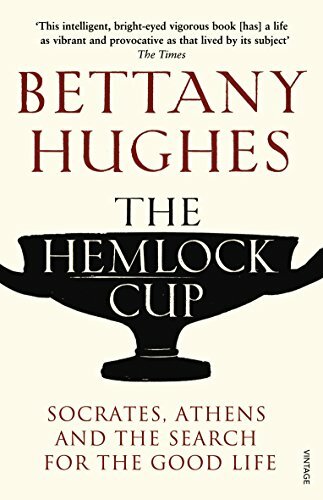 I am intrigued to find out how your final book, Bettany Hughes’s The Hemlock Cup: Socrates, Athens and the Search for the Good Life, fits in with your theme. I know it sounds rather odd, but it does. I went to the Hay Festival and I heard Bettany Hughes speak on this and then I read her book. It is very detailed about Socrates’s life and where he grew up, and is a very practical book in that it discusses the world around him rather than his philosophy. The nub of the book is all around his death with the hemlock cup and his criticism of the emerging democracy of the day. Socrates basically was saying he wasn’t sure that the democracy that they were trying to sell to us was really the way forward. What was really interesting about it was that he wasn’t worried so much about democracy itself but about the way they were doing it. They were creating huge amounts of wealth in a single place and forcing everyone to become a democracy. It made me think that maybe Socrates was one of the first environmentalists when he began to see that greed wasn’t the best way forward. Although it was sold under the guise of a democracy, using up lots of resources and gathering lots of wealth from different places wasn’t actually making Athenians any happier. And they ended up putting up huge walls to protect themselves and prevent other people from coming to steal back their wealth. It really is interesting to go back in time and look at alternative societies and democracies and where they succeeded and failed. Obviously there are parallels with what is going on in this century. Yes. I know it is not as direct as my other choices but it is important to me. We talk about growth but what we don’t talk about is the shrinking of the environment that we use to increase that growth. What do you see as the biggest threat to the environment and how can we do our bit as individuals? Our use of high-carbon energy is the main problem. The downturn has had the welcome effect – if you can put it like that – of reducing the total amount of energy we are using, but we continue to use a lot of fossil fuel-based energy. People go around saying lots of small actions don’t make a difference, but actually they do. Many of us are beginning to feel the pinch when it comes to petrol but we still manage to make a lot of trips. Another important area is our homes. We all want to be warm and have light and many of us want to watch TV. All of those things use energy. One way to help with that is, first of all, to understand just how much energy we are using. Everyone can get a hand-held meter, connect it in your home and begin to see how much energy you use. Insulation is another key area. We have quite a lot of windows in our home. I have just put double-glazing in two of them and I am going to slowly save up and work through the whole house, because it makes a huge difference. You don’t have to do it all at once but you can do it slowly over time. Put curtains over doors to reduce draughts and look at the insulation in your roof. Most people don’t have enough insulation in their roof. Even if you already put one layer down, you should actually put two or even three layers down. These are very simple things you can do. It takes time and money, but all of those things will in the long term save people money and improve their impact on the environment.